In today’s hypercompetitive education marketplace, student recruitment and growing enrollments is paramount to continued success. 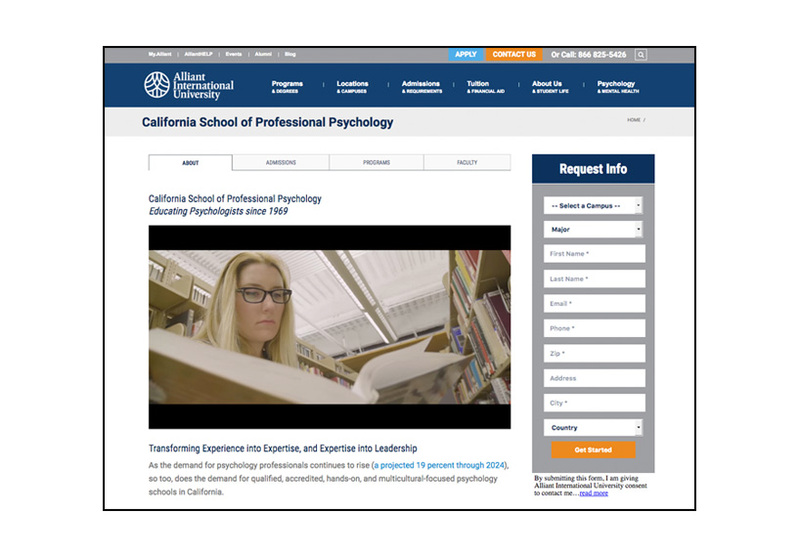 Especially for a school like Alliant playing in a very specific niche when it comes to attracting best-fit students: post-grad and doctoral level psychology degrees primarily in the state of California. To fit all the pieces together, we’re helping Alliant move past the expected marketing channels into their digital counterparts. We’re tightening up the targeting, increasing efficiencies and margins, eliminating wasted impressions, increasing qualified lead volumes and introducing new channels. So when those very specific students are looking for very specific programs, they’re finding a very specific school: Alliant. Team frank’s organic and content SEO specialists take a niche approach to connect with a highly niche audience. Paid media searches drive ongoing keyword research, which in turn drives the development of richer and deeper content based on those specific keywords. It’s a continual loop that integrates content with keywords to get the right information in front of the right prospects. 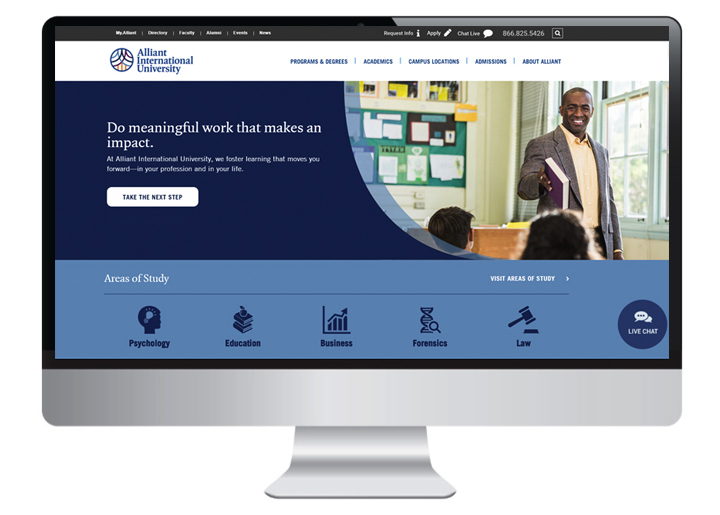 Alliant’s redesigned blog not only features content that connects with the psychology education community, it‘s also built for conversion with lead forms and chat interaction to capture potential students as they engage with the brand. 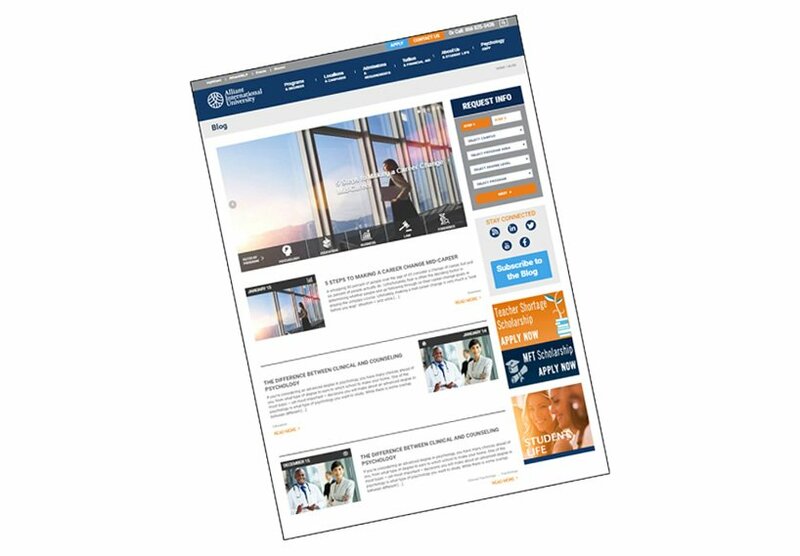 The video-embedded landing page helps nurture leads through the recruitment funnel while collecting rich student data for campaign analysis and follow-up by Alliant’s enrollment specialists. The partnership package we developed for the Dr. Drew podcast builds credibility and awareness for the brand with loyal listeners. Between audio mentions, social media inclusions and website/newsletter display ads, we’re reaching potential students throughout their day in a tightly targeted arena. 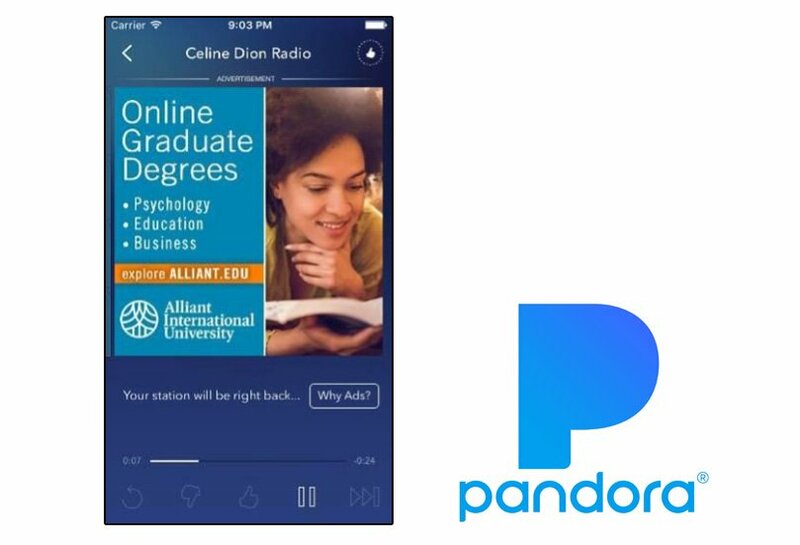 We’ve introduced streaming radio as a new digital channel in Alliant’s mix. 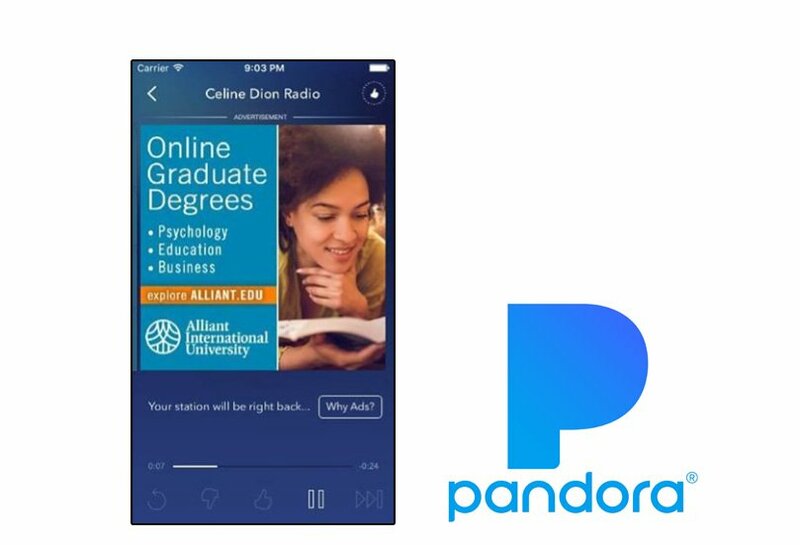 Lead-gen ads on Pandora target by campus location, education level, behavioral interests and down to specific degree programs, all the while driving potential students further along through the conversion funnel. 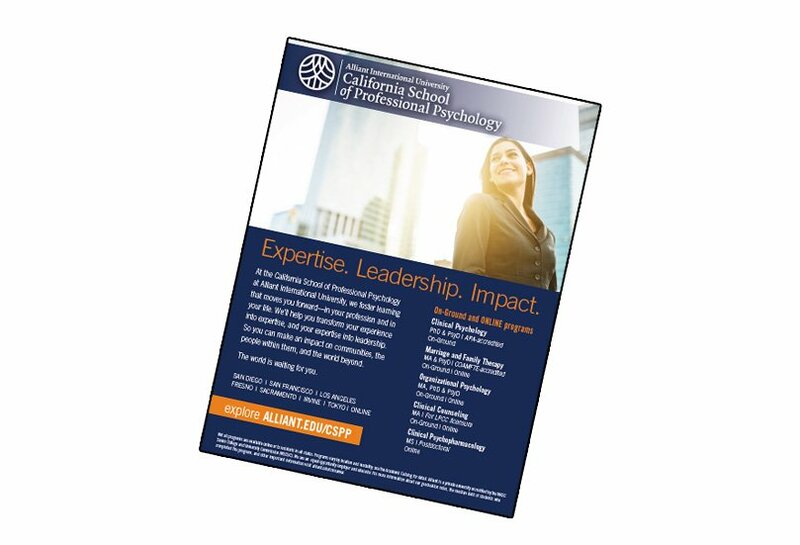 Direct response print ads in publications like Psychology Today build the Alliant brand and drive inquiries. Not to mention the value add Team frank’s media group has negotiated to stretch both budget and reach, including featured content from Alliant aligned with various magazines’ editorial calendars. Finding just the right marketing partner can be an exhausting experience of RFPs, interviews, presentations and deliberations. Or, it can be a phone call. Well, at least it can start that way. And we’d love to get started with you. So, go ahead, push a few buttons and talk to us. We won’t ask you to guarantee that you’ll hire us. But, if you do, we guarantee you’ll be glad you did.